New Year's Day sermon preached in Southwest PRC by guest minister, Prof. D. Engelsma (PRC Seminary). Preached in First PRC, Grand Rapids, MI, by guest preacher, Prof.D.Engelsma. Preached in First PRC, Grand Rapids, MI, by guest preacher, Prof. (emeritus) David Engelsma. The message is based on Lord's Day 1, Q&A 1-2 of the Heidelberg Catechism. 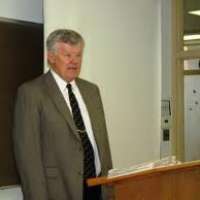 Preached in First PRC, Grand Rapids, MI, by guest preacher professor (emeritus) D.Engelsma, as part of a series on the Lord's Prayer, based on the Heidelberg Catechism, Q&A 127.